Recognized economists, writing on the subject of the anticipated Trump presidency, predict a “short” four-year term that will be damaging to jobless and low-wage American workers. It is now predicted that the nation’s big corporations and Wall Street will retain the upper hand over struggling workers who helped to elect him in what’s recognized as a populist wave. For the purpose of clarity, let’s spend a moment looking at the definition of populism. It is a political ideology that holds that virtuous citizens are mistreated by a circle of elites who can be overthrown if the people recognize the danger and work together. Populism depicts elites as trampling the rights, values and voice of the “legitimate” people. No sober person of economic understanding sees it likely or even plausible that Trump’s plan to repatriate huge corporate profits to the U.S. for infrastructure spending will succeed. In fact, what we know of the sketchy and abbreviated ideas from Trump during the many months he ran for the highest office, we can expect a continuation of the status quo, remaining pretty much the same or with little noticeable change. Economists of considerable reputation on prospects for changes to unemployment and joblessness numbers are amazed at the willingness of the American voters for what they have done to themselves. Global populism may be the wave of the future but it has taken a turn in America that will only end in more disappointments and disillusions among those who voted for Trump in hope of seeing factories and jobs return to the midwest industrial states and most everywhere else in the U.S. Those with insight also believe that even American investors inside the country will proceed with extreme caution, understanding that higher deficits, resulting from the lower taxes Trump has promised, will raise interest rates and inflation and result in lower earnings and fewer job opportunities. Trump made rash promises by the dozens. He’s already said he’ll settle for a fence in some places with the border with Mexico, instead of a wall. He’ll only deport criminal immigrants. He’ll gut the Affordable Care Act (Obamacare), he said, but now says some provisions will stay. He promised to “drain the swamp” in Washington, D.C. but proceeded immediately after his election to choose entrenched lobbyists, one of America’s most notorious bigots and a racist, and mainly members of his own family, especially his young son-in-law, Jared Kushner, whose father and mentor was convicted of crimes and spent years in prison. Then, too, full court nepotism and conflict-of-interest will prevail as Kushner runs the White House while his wife, Ivanka, Donald’s daughter, runs the Trump business empire. Based on what’s known about Donald J. Trump to date, prospects on him further dividing our country appear highly certain. He could surprise us by positive moves that settle the dust storm currently airborne. But he remains to date a self-centered individual whose ego must be stroked constantly, his coffers must fill over with no end to the greed, while family and friends being loyal to him is more important than the welfare and very survival of our nation. Keizer has earned an honorable mention as a bicycle-friendly city from the League of American Bicyclists (LAB). It was announced last week in Washington, D.C., that Keizer joined 33 other communities throughout the nation in the honorable mention category of recognition. Platinum, gold, silver and bronze designations are also available should city officials decide to pursue them. Oregon has 11 communities that rank bronze or higher. Ashland (gold), Corvallis (gold) and Bend (silver) also received designations this time around. An honorable mention recognizes Keizer’s efforts toward improving conditions for bicycling through investment in bicycling promotion, education programs, infrastructure and pro-bicycling policies. The Bicycle Friendly City (BFC) program provides a benchmark for communities to evaluate those conditions and policies, while highlighting areas for improvement. A trio of city volunteers were the driving force behind the application to LAB. Hersch Sangster, Pat Fisher and John Henry Maurice, all members of Keizer’s Traffic, Bikeways and Pedestrian Safety Committee, took on the effort with the blessing of the city council. More than an honorable mention or a metal designation, the group wanted a baseline assessment of where Keizer stood in relation to other cities in the LAB program. In addition judging the application to the program, LAB officials sought out input from residents who use Keizer’s bikeways through an online survey and then selected some responders to interview about their experiences. The results were somewhat mixed. Keizer outperformed other cities in some categories but lagged behind in some key areas. While only 20 percent of the average city’s high speed roads have bike facilities,, 45 percent of Keizer’s do. Keizer’s bicycle-friendly laws and ordinances were rated “excellent,” far above the standard community with a BFC designation. Keizer was also deemed to have good Bike Month and Bike-to-Work events. Other assessments were less kind to Keizer. While the BFC program suggests 9 percent of the city’s transportation budget be spent on cycling, Keizer clocked in at 1 percent. Bicycle education programs were also found to be needing improvement. Keizer also generally scored on the low end of cycling encouragement, enforcement and evaluation and planning. • Adopting a complete streets policy requiring all new road or repaving projects to include bicycle striping. • Making bicycle safety a routine part of education for students of all ages. • Increasing staff time spent on improving conditions for those who bike or walk. Sangster said that the biggest impact could likely be seen with more education, but making it a priority on the local level is something that happens school-by-school. “The schools just don’t have the budget for it here, unlike Portland where it is an actual program in place,” he said. In times when more funding was available, the Salem-Keizer School District would host Safety Town camps during summer months that guided students toward best practices, but the camps fell victim to budget cuts. “Bringing things like that back will require a budget and volunteers,” said Sangster who was one of the Safety Town instructors. On the whole, he’s been pleased with Keizer’s acceptance of pro-cycling policy and inclusion. “The roundabout was a great example of that. We felt like we were part of that discussion from the start,” Sangster said. He also commended the city for adopting a planning policy requiring bike parking within 50 feet of entrances. If he had one wish, it would be for more enforcement of bike laws. He cited adult riders disobeying traffic control devices or traveling the wrong way as two areas of concern. The other area where Sangster saw opportunity was in encouraging local businesses to apply for a “Bicycle Friendly” designation through Travel Oregon. While food destinations are the logical starting point, Sangster said bikers on long rides make use of everything from banks to hotels. “I really think it’s just a matter of connecting with the Chamber of Commerce and helping them promote it to members,” Sangster said. Another added benefit to the BFC designation is that Keizer can use it as a feather in its cap when applying for transportation and other grants to improve local amenities. Keizer will have to reapply to the program annually to maintain its honorable mention designation. Part of Justin Nielsen’s mission as executive director of Renaissance Recovery is meeting each client where they are. The result is what Nielsen calls “cafeteria-style” offerings that allow each client to pursue their own recovery goals while drawing on many different paths to kicking substance abuse habits. At Renaissance, a client might choose SMART Recovery, a science-based treatment program, or Celebrate Recovery, which takes its guidance directly from biblical teachings, or some combination of the two. Regardless, Nielsen tries to stay on the cutting edge of what’s available to those struggling with addiction, which is what led him to rolling out a new opioid addiction treatment program that include buprenorphine, more commonly know by the brand name Suboxone. The program is only two months old, but it’s grown to include nearly two dozen clients, some of whom are driving from three or four hours away. “I underestimated the need, and there are fewer buprenorphine prescribers than ever,” said Neilsen. Buprenorphine is an alternative to the methadone for opioid addiction, and while the two drugs share a number of side effects, buprenorphine causes less sedation. Both drugs work by dampening opioid receptors and lessening the craving for the high induced by heroin or opioid pain-relievers like hydrocodone and oxycodone. Becoming a buprenorphine presbscriber can result in added costs for a doctor. It can mean paying more for liability insurance and costs related to support, tracking and accountability, which Nielsen said seemed to be the primary reasons for the low number of doctors willing to take it on. Conversely, the partner doctor at Renaissance Recovery is nearly tripling the number of his available buprenorphine prescriptions with the onset of the new year (2017). The goal with each new client is to work toward full recovery in about a year on average, Nielsen said. Clients enrolled in the program receive a prescription for buprenorphine along with a variety of support services to aid recovery efforts. For the first two months, new clients must check in with the doctor every week, and then less often as the dose of the drug is gradually reduced. The support side of recovery is where Nielsen feels Renaissance Recovery is poised to make the biggest impact. “We’ve started seeing an even more diverse group of clients. In the past it was what some people would see as the stereotypical addict or repeat DUII offender, but now it’s people who got in a bad car wreck, were prescribed Vicodin and have since moved on to heroin or other substances,” he said. Other societal changes have also led Nielsen to change the way Renaissance does business. “We’ve embraced technology because we found many of our clients were willing to. Every client that comes in can sign into our secure website and they can send messages to their counselor, find out meeting times and topics at our site and tap into other available resources,” Nielsen said. Progress in the ways addiction is thought about – and treated – have also had an influence. Traditionally, recovery programs viewed abstinence as the only route to health, but Nielsen said the industry is moving toward a harm reduction model. Rather than trying to hold clients to pledges of going cold turkey, it might mean coming up with new parameters when they are using controlling substances – like not drinking alone, or not injecting drugs. “I always think what we do is a taboo subject and a lot of people don’t want to admit how big the problem is. We’re trying to take a leadership role in recognizing the problem and meeting it,” Nielsen said. The success of the buprenorphine program and other have led Nielsen to increase the number of employees on site and expand the hours of some existing employees. For more information about programs available at Renaissance Recovery, visit renaissancerecoveryresources.com, or call 503-304-4358. Renaissance Recovery partners with more than 20 insurance agencies and is part of two coordinated care organizations that qualify for the Oregon Health Plan. Sydney Hunter couldn’t wait to fulfill her dream of playing college basketball so on the first day of the early signing period, Wednesday, Nov. 9, she put pen to paper. The McNary senior, who averaged 10.8 points, six rebounds, two assists and two steals per game for the Lady Celts last season, signed with the University of San Diego. Hunter began playing basketball in kindergarten but the game has been in her life even longer. Her older sister, by five years, Devin, was also a star at McNary before signing with Oregon State. While Hunter admitted Devin is “way stronger” thanks to four years in the Oregon State weight room, Sydney claimed she’s the better shooter. San Diego first got in contact with Hunter early in her high school career. Coaches then came to McNary to watch her play volleyball during her junior season. Hunter visited the campus and committed to the Lady Toreros program last summer. According to McNary head coach Derick Handley, what makes Hunter special is the combination of being a great athlete and a hard worker. “The reality is Sydney is one of the hardest workers I’ve ever had the opportunity of coaching,” Handley said. Hunter, who will be a team captain for the third time this season, is also a leader. “She’s very supportive of her teammates,” Handley said. “She’s the first to criticize herself. She understands when she makes a mistake and if I were to say that Sydney had a flaw, I would say sometimes she’s too hard on herself. She expects perfection every time she goes out there. As a head coach, that’s a dream. That’s exactly what you want to see out of your best players, is they set the tone, not only how they treat their teammates but the expectations they hold themselves to. San Diego plays in the West Coast Conference with the likes of Gonzaga, Saint Mary’s and Santa Clara. The Lady Toreros finished 25-8 last season, which was the second most wins in program history, and lost to Michigan in the Sweet 16 round of the Women’s National Invitation Tournament. That’s what people tell you about high school. Remember those days, they say. They’ll be the best of your life. But zits, mean girls, broken dreams, and broken friends aren’t exactly best. Sometimes in high school, as in the new book “Faithful” by Alice Hoffman, the very worst things can happen. Nobody thought it was anything but an accident. The road was icy that night. Shelby Richmond was driving and she wasn’t speeding. She never was sure why her best friend, Helene, sitting in the passenger’s seat, didn’t buckle up like she usually did. Parts of the night remained sketchy, but the thing Shelby knew was that the car spun out of control and Helene was left in a coma. Seventeen years old. Helene had a lifetime left, but she’d never live it. Instead, she lay in her childhood bedroom, tended by volunteers, visited by people who believed her capable of bestowing miracles. Seventeen years old. Shelby believed that she, not Helene, should be in the coma. She cut her hair completely off. Buzz-cut, in fact, and she stopped eating. All Shelby wanted was to smoke weed and sleep while her mother flitted upstairs in their home and her father disappeared as often as he could. Her only friend, if you could call him that, was Ben, her dealer. And it was Ben she moved to New York with, after they graduated – a graduation Helene would never have. In New York , Shelby got a job and discovered that she liked animals. She worked her way up to manager of a pet store. Someone said she was pretty, so she grew her hair again, and she made a best friend. And Ben loved her, but she couldn’t love him back. Shelby didn’t deserve Ben. She wasn’t lovable. But was that true? Her dogs certainly adored her. Her mother never stopped loving her, fiercely. Her father tried (or so he said). And then there was the stranger who’d been sending postcards to Shelby ever since the accident… weren’t inspirational, anonymous notes some form of caring? In a small way, “Faithful” defies categorizing. Its plot is minimal: it’s a story arc roughly set in a ten-year period of one woman’s rather unremarkable life. Granted, not everybody does what author Alice Hoffman lets her character do, but what happened to Shelby , happens to others. And yet, this story is singular. And it’s impossible to stop reading. There’s a crispness in this novel that doesn’t become too harsh; instead, it’s comfortable, like an old yearbook. After a few pages, in fact, it’s almost as if we went to school with Shelby , or avoided her on the playground. We know her – and when Hoffman puts her in unique (yet not outlandish) situations, Shelby ’s actions are satisfyingly right. Come to think of it, so is this whole book. Mark it down; it should be your next Book Group pick. It should be on your bedside table. 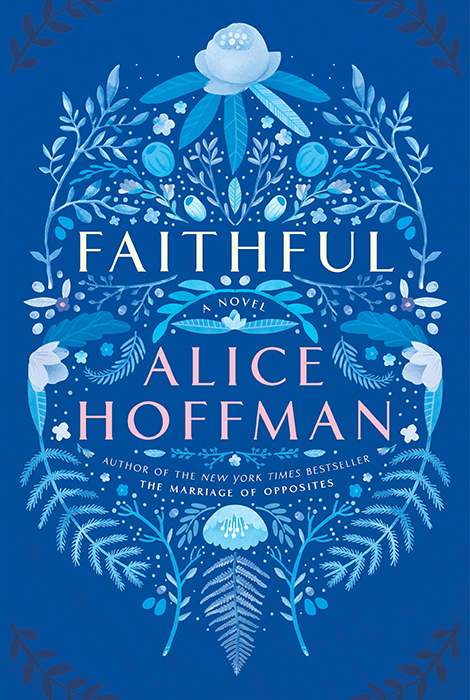 If you love novels, “Faithful” may be your best book this year.